Why did you become a Public and Community Service major? In high school, I took part in a lot of mission and service trips. These trips opened my eyes to ways in which I could serve others, but I found that they lacked intentionality. One of my first trips to Kenya taught me a term — Ubuntu — which means “I am because we all are. My humanity is connected to yours because we are human.” Ubuntu’s call for interconnectedness has challenged me to prioritize relationship building in service. I want to be engaged, and I want to be engaged for the long term. However, I never knew that “public service” and “community” were concepts I could study and engage with first hand as a college student … until I found the Public and Community Service (PSP) major at PC. 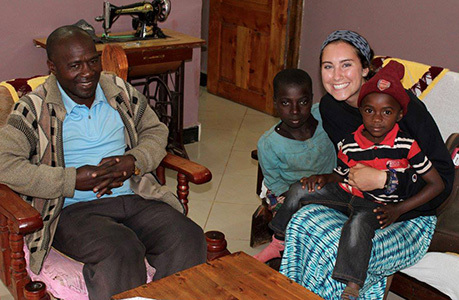 I knew I was passionate about service in the global and local contexts, and I wanted to study something that I loved. The PSP major let me do just that — it was perfect, and it was the place where I was able to revisit “Ubuntu” and understand it as something that I could try to put into practice. Public and Community Service Studies provides you with the opportunity to be in an engaging environment where you can collaboratively learn alongside others. We sit in a circle and critically reflect on what we are learning both inside the classroom and outside in the local community. We build authentic relationships and really learn what the words “service” and “community” mean. In addition to this, the major has faculty that want to build relationships with you and to get to know you, that want you to call them by their first name, and that actively seek out opportunities to learn from you and alongside you. The faculty in the PSP department care about you as an individual and push you to pursue your passions and be the very best version of yourself. How has being a PSP major impacted your experience at PC? When I think about how much being a Public and Community Service Studies major has impacted not only my experience at Providence College but also my life as a whole, I think back to one of my very first PSP classes and a piece we read called “To Hell with Good Intentions” by Ivan Illich. This reading was the first time I had ever read a critique of service, and it completely shook my core. 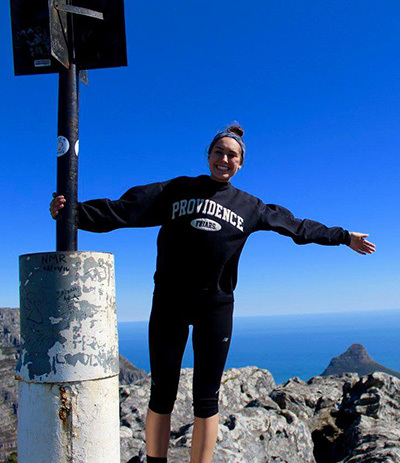 Fast forward to right now as I am a rising senior at PC, I have been on two global service learning trips, one to San Diego and Tijuana to study Global Border Crossing and another to Cape Town, South Africa, to study Social Infrastructures. I have served alongside a refugee family from the Congo at Dorcas International Institute of Rhode Island and taken part in their daughter’s wedding. I have studied community development and become proficient in Swahili in Tanzania for four months. I have served alongside young artists at CityArts and discovered that I have a love for arts as social change, photography, and storytelling. I have learned how to become a community organizer and assisted in changing policies with the ACLU around those experiencing homelessness in Rhode Island alongside Rhode Island Coalition for the Homeless. Currently, I am a Community Assistant at English for Action in the Family Literacy Program, facilitating ESL classes for youth in the Olneyville (Providence) neighborhood. I am a student researcher for my adviser. I will be leading a global service learning trip to Cape Town this summer and conducting research on agroecology in Cape Town to form a case for Philippi Horticultural Area to submit to the United Nations so that it can be recognized as a Globally Important Agricultural Heritage System. I guess I’ve been pretty busy. But, I’m doing things I love and learning a ton along the way. I came into college wanting to learn how to organize, wanting to experience storytelling, wanting to work one on one with diverse organizations in Providence, yet being a PSP major has provided me with so much more than just these things. This major has taught me that building relationships takes time and commitment and that it is hard work. It taught me that communities are layered and complex and that engagement means being vulnerable in sharing ourselves with others. The PSP major taught me the importance of interconnectedness and stories. It taught me that service is about facilitating change in communities and utilizing assets rather than deficits. This major has taught me about my privilege and has helped me to unpack this, while at the same time giving me the skills to be a better ally. It has given me friends, it has opened my eyes to the many things that I hold passions for. It has brought me moments of joy and challenge, but in the end it has taught me to seek out ubuntu — that “I am because we are” means that we all need each other and we cannot be human without each other. What would you say to students who are considering being a major or minor in PSP? You can really take this major anywhere, and the special part about the Public and Community Service Studies program is that you can really form it into something of your own — based on your own passions and your own path. If you want to create social change you HAVE to start where you are at. If you want to be engaged in the community around you and serve alongside activists in a dynamic setting, then being a PSP major (or minor) at PC is the place for you. You will have the opportunity to explore your interests within this major and get involved in the greater Providence community. The Public and Community Service Studies department gives you the opportunity to learn in a unique way where you will go outside your comfort zone and build relationships alongside so many diverse individuals and organizations. It will really change and challenge the way you think about issues throughout the local community and the world. But most importantly, PSP will give you a community of family and friends to help you pursue and understand your passions on a deeper level.